Powerfully clean. Amazingly easy. Unquestionably green. Now if you were shopping for laundry soap isn’t that what you would be looking for? I received 3 samples of dropps in the mail. They look like the dish washing packets that you throw in the dishwasher. No liquid spills or messy powder in the laundry room anymore. Dropps come in 3 different varieties. Fresh scent, scent and dye free, and scent, dye and enzyme free for baby. I used all 3 of these. I used the Fresh scent for Kendalls work clothes cause lets be honest…they smell yucky from grease and grim and fumes all day. I used the scent and dye free on our towels and linens and washed Sadie’s clothes with the baby dropps. They were all wonderful. Easy to use, no mess and the clothes were clean. Now wouldn’t that make you one happy lady? Its super-concentrated formula fits in tiny, pre-measured toss and go dissolvable packets. No more big plastic containers to that take up half your recycling bags which means its great for the environment too. Dropps are perfect for all colors, all fabrics, all washers and all temperatures. 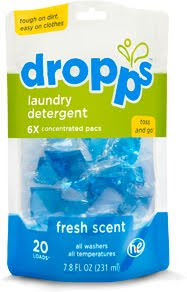 Dropps laundry detergent is sold in 42, 26, 20 and 2-load pouches. They are all available on Amazon.com as well as Fresh Scent only at Walmart. Visit www.dropps.com to learn more.